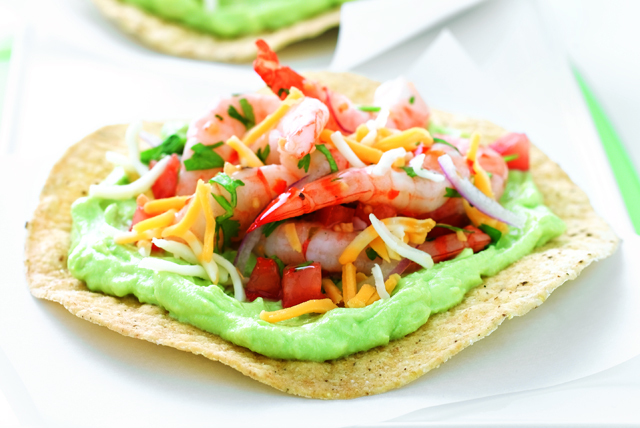 Summer sweet shrimp with a cilantro lime marinade top this savory avocado cream for a refreshing twist on the classic tostada. Combine first 5 ingredients in large glass bowl. Add shrimp; toss to evenly coat. Refrigerate 20 min. Mash avocado with cream cheese in small bowl; spread onto tostada shells. Drain shrimp mixture; spoon onto tostada shells. Sprinkle with shredded cheese. Serve with a side of cooked rice and black beans. For a spicier tostada, add chopped fresh jalapeños peppers to avocado mixture before using as directed. Substitute your favorite cooked seafood, such as crabmeat or chunks of white fish, for the shrimp.